- A left work a little early on Friday so we could go 'officially become Maryland residents'. Can I just say, we've been to many different motor vehicle branches in many states - Maryland wasn't my favorite. However, I didn't have to take another knowledge exam so that says a lot about the drivers here. They printed my id out right on the spot so I didn't have to carry around a temp which was a new thing for me. Treat us nicely, Maryand! 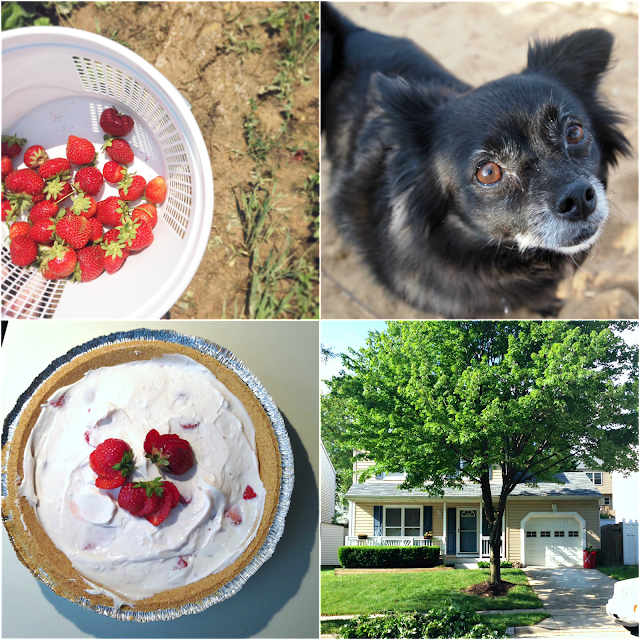 - Saturday was one of the last days for strawberry picking around here. I took A out for his first ever pick-your-own berries. The fresh air and hard work was much enjoyed. I will give it to him though - he picked way more strawberries than I did. I prefer to eat while I work!! Also, when life gives you strawberries, you are responsible for making strawberry cheesecake - it's the circle of life. - The tree in front of our house has been neglected for several years (at least that's what the neighbors told us). When we would get tons of rain, the branches would rub against the top of the car if it was in the driveway. So we did some adult work and trimmed back the tree. It's amazing how many neighbors will come by and say hello when you are out working. Hello neighbors! - Dinner was a lovely and expensive evening of sushi. The restaurant we went to was just around the corner from our house and the staff was absolutely lovely, and the food was pretty darn tasty. We ordered far too much food, because 4-5 sushi rolls never seems to be enough until you have 7 rolls presented to you. Sushi coma. - We woke up bright and early Sunday and heading to the park and the dog beach. Roxi just loves it there and it doesn't take much to convince me to go. - After doing some errands and A worked on the cars, we loaded up or bikes and headed back to the park. Biked about 5.5 miles through both paved and unpaved trails, killed a couple of ticks that decided we might be good hosts, and picked up a Snoball on the way home. We are working our way through all of the flavors and we still have a ways to go. What did you do this weekend? Was the weather lovely to do outdoor activities? When we moved back to IN, I had to take the written test even though I have lived here my entire life except for three years in PA. I even have my old license number! We had to take the written test in IN, as well as, CA and MI. It was really nice not having to take it again here in MD, but really?! I think it's better to test again.